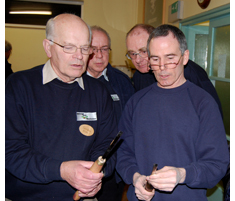 Cambridge Woodturners welcomes new members of all abilities. The Club annual subscription is £12 for an individual aged 22 and over, £18 for a couple/family. In addition members must join the AWGB whose subscriptions are £18 for individual membership for those aged 22 or over, £28 for a couple/family (all subscription rates as at January 2018). For information about the AWGB membership contact the Treasurer / Membership Secretary at a meeting. Junior membership of the Club and AWGB for people aged under 22 on 1st January of membership year is Free. All prospective members are welcome to attend two meetings free of charge before joining.